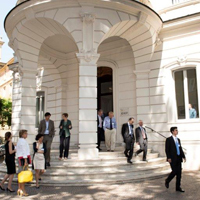 The CEPR, the Einaudi Institute for Economics and Finance (EIEF), the Copenhagen Business School, HEC Paris, the Observatoire de l’Epargne Européenne (OEE), and the Swedish House of Finance (SHoF) at the Stockholm School of Economics organized the 2016 CEPR European Conference on Household Finance. 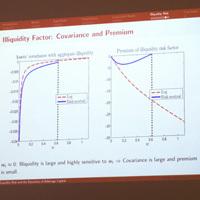 The conference was the seventh in a series of annual European conferences and aimed to present state-of-the-art empirical research and empirically motivated theoretical research on household financial behavior and on how this is influenced by other choices, government policies, and the overall economic environment. More information is available here. The Centre for Studies in Economics and Finance (CSEF), the Einaudi Institute for Economics and Finance (EIEF) and the Stanford Institute for Theoretical Economics (SITE) organized a conference on the relationships between finance and labor. While the conference was open to all topics in this area, preference was given to papers dealing with the interaction of financial and labor markets for a broad range of employees, as opposed to focusing on executive compensation. The conference aimed to bring together researchers from financial and labor economics to discuss issues from the point of view of both disciplines. 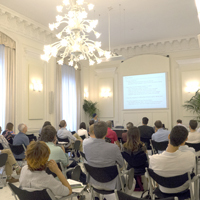 This conference was funded by two ERC Advanced Grants, respectively awarded to Claudio Michelacci for research on “Estimation of General Equilibrium Labor Market Search Models” (no. 293692 – ESEMO), and to Marco Pagano for research on “Finance and Labor” (no. 295709 – FINLAB). Related conferences were organized by CSEF in 2013, SITE in 2014 and EIEF in 2015. For more information, please visit the CSEF’s website. EIEF hosted the “2nd Summer Workshop in Political Economy”. The aim was to analyze topics related to the institutional underpinning of fiscal policies. The workshop focused on research at the intersection of political economy, public finance, and macroeconomics. Topics of interest included: (i) the political determination of public policies (fiscal and monetary policy, social insurance, taxation, transfer programs, public investment, public employment, regulation, education, and health); (ii) the effects of political reforms; (iv) the impact of budgeting rules; (v) political polarization and partisan conflict; (vi) economic policy uncertainty and its determinants. The members of the organizing committee were: Marina Azzimonti (Stonybrook), Facundo Piguillem (EIEF) and Alessandro Riboni (Ecole Polytechnique). Participants received an invitation from the organizing committee. Program. EIEF hosted the “5th Rome Conference on Macroeconomics”, a.k.a. Pizzanomics. The aim was to bring together junior economists from around the world with a strong interest in Macroeconomics, and to generate a friendly environment with intensive interaction, not only during the presentations but also informally before and after. Speakers received direct invitation. The organizers were: Guillermo Ordoñez (University of Pennsylvania), Luigi Paciello (EIEF), Facundo Piguillem (EIEF), and Nicholas Trachter (FED, Richmond). Program. 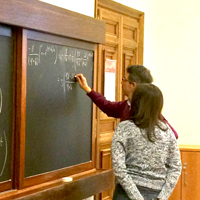 EIEF hosted the “1st Rome Junior Conference on Applied Microeconomics”. The aim was to foster interaction and dissemination of research idea among researchers active in different areas of applied microeconomics. The selection of invited presenters gave preference to faculty at the early stages of their career. The members of the organizing committee were: Mary-Ann Bronson (Georgetown University), Francesco Decarolis (Boston University and EIEF), Thibaut Lamadon (University of Chicago), Neale Mahoney (University of Chicago - Booth School of Business), Andrea Pozzi (EIEF) and Alessandra Voena (University of Chicago). Program. EIEF hosted the “1st Rome Junior Finance Conference”. The goal of the conference was to bring together junior researchers active in empirical and theoretical finance and create an opportunity for informal discussions and other academic-related activities. The members of the organizing committee were: Marco Di Maggio (Columbia Business School), Sergei Kovbasyuk (EIEF), Andrey Malenko (MIT Sloan), Nadya Malenko (BC Carroll), Adrien Matray (Princeton), Anton Tsoy (EIEF), Boris Vallee (HBS). For more details, see the Program. On February 8, 2016, EIEF hosted the “Presentation of the World Development Report of the World Bank for 2016, Digital Dividends”. The Report documents examples where the IC technologies have boosted growth and improved services. But it also finds that the broader benefits have gone disproportionately to those best equipped to take advantage of the digital revolution. The event was by invitation only. For more details, see the program.